This is a great recipe for the holidays. It reminds me of banana bread when it is baking in the oven, which always makes me feel like I am home with mom. I added a little maple flavoring to the recipe because whenever my mom made banana bread when I was living at home, she would always make a maple glaze to put over the top. It was the best part of the bread. In this case though, I opted for a dark chocolate drizzle for the top. Who wouldn't love that? 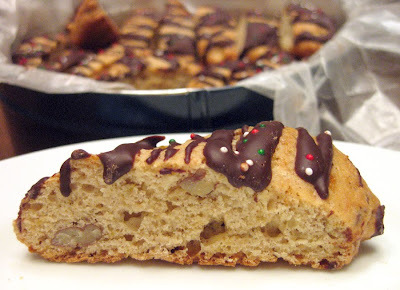 I adapted a cooking light recipe to create a delicious holiday biscotti perfect for gift giving. I just sent these and gingerbread biscotti to my brother who lives out of state. I will post the gingerbread recipe soon. Lightly spoon flour into dry measuring cups, and level with a knife. Combine the flour, sugar, baking powder, and salt. Combine banana, oil, vanilla, maple, molasses and egg in a medium bowl; stir in flour mixture and pecans (dough will be sticky). With a dough scraper or spatula divide dough into 4 parts. Scoop dough onto parchment lined baking sheets; shaping dough into 4 (8-inch-long) rolls with wet hands. Flatten to 1/2-inch thickness. Bake at 350° for 18-20 minutes. Remove rolls from baking sheet; cool 10 minutes on a wire rack. Cut each roll diagonally into 12 (1/2-inch) slices. Place slices, cut sides down, on baking sheet. Reduce oven temperature to 250°; bake 12 minutes. Turn cookies over; bake an additional 12 minutes (cookies will be slightly soft in center but will harden as they cool). Remove from baking sheet; cool completely on wire racks. Drizzle with dark chocolate if desired. I love this biscotti recipe. I haven't made in a while but now you reminded me to do so!